Mix well, pour batter into 13 x 9 inch pan that has been sprayed with vegetable cooking spray, and bake for 30-35 minutes or until an inserted toothpick comes out clean. Beat all icing ingredents until fluffy and spread on cool cake. "It was a big box, light as air. 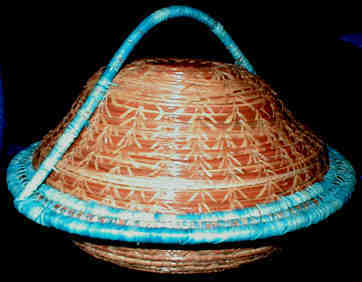 Inside was a North Carolina pine needle coiled basket -- Pine Needles, Leather and Raffia. "The base was started around a leather disc with a butterfly tooled on it. Barbara used a couple of stitches, one being the wheat stitch, to create a beautiful design on it. "It's a low bowl perfect to put stuff in, like a candy dish. But it will never see any candy by me. "The lid again was started around a leather disc, this time with the letter 'D' tooled onto it. (Now, mind you it didn't dawn on me till the next morning when I was looking at it again, that it was my initial. daaaa) Barbara has been paying attention, my initial, a butterful to go with my gardening, and the lid was also trimmed with a blue raffia - one of my favorite colors. Barbara must have been peaking in my back window to see that this color is also going to go perfectly with the color I'm redecorating with. I could not be happier. (Well, maybe if I won a big lottery.) I can hardly wait to finish with my decorating so I can place it on one of the new corner shelves I'm planning on making and installing for my exchange baskets. "To complete the package Barbara send a recipe for an Applesauce Cake. Again I just know Barbara's been peaking because I have a 2 cases of homemade applesauce in the basement that we canned last summer. I was looking at it last week thinking I must do something with it. It arrived at a perfect time because I just discovered I have to bake for gathering at work on Thursday. So, this is perfect I'll try making this wonderful recipe tomorrow night. I say try because this will be my first time working with egg substitute. "Barbara, this recipe I expect to treasure always because it uses the applesauce I've made, the egg substitute, light cream cheese and skim milk. I'm trying to learn to cook healthier. Your recipe looks like it will be my start of a collection. Thank You, Barbara. These gifts will be treasured always. "